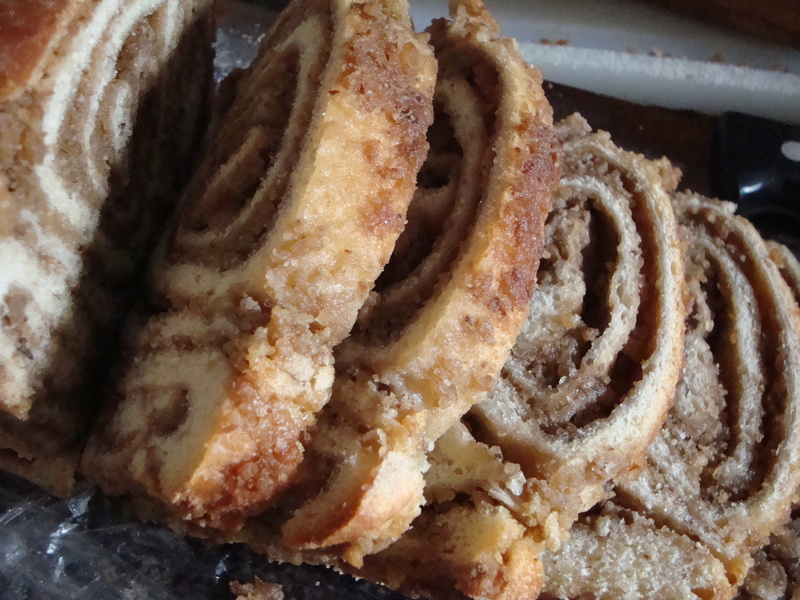 (pō-vi-TEE-sah) A holiday tradition from Croatia, this sweet nut bread swirled with a walnut filling is made for Christmas and Easter, weddings and other celebrations. Povitica is traditionally eaten for dessert or as a breakfast bread. It can also be topped with sliced ham, or toasted. Prepare filling by heating milk and butter in a heavy saucepan over medium-high heat until small bubbles begin to form on surface. Remove from heat. In a large bowl, combine the walnuts, sugar, milk mixture and cinnamon, if using. (Not traditional in my family, but I’ve started adding it.) Mix in egg. Cover and set aside. Filling will thicken as it cools. Note: Can be made a day in advance and refrigerated. Bring to room temperature before using. Proof yeast by dissolving in 1/4 cup warm water (around 100 degrees); sprinkle with a teaspoon of sugar. Set aside for about five minutes until it “proofs” or bubbles, which indicates the yeast is active. In a large bowl or stand mixer, combine milk, sugar and salt. Beat in the egg and egg yolk, ¼ cup of the melted butter and yeast. Add two cups flour and beat until smooth. Add additional flour as needed, 1 cup at a time, until the dough forms a ball and leaves the sides of the bowl. Knead with dough hook in the stand mixer, or turn out onto a floured surface to knead by hand. Knead until dough is smooth and elastic, adding additional flour as needed to keep from sticking. Form into a ball and transfer to a large, greased bowl. Cover and let rise about 1 hour, or until doubled in bulk. Preheat oven to 325 degrees. Grease and flour two 9-by-5-inch loaf pans. Divide dough into two portions. To assemble povitica, cover a large table or work surface with a clean cloth (a sheet comes in handy for this) and dust with flour. Place one portion of dough in the center and roll out into a circular shape. (The size isn’t important as the aim is to then continue stretching the dough by hand, pulling it paper-thin.) Once dough is rolled out, begin stretching it out toward edges of the work surface, working the dough from underneath with your palms and fingers turned upward. The dough is very elastic and stretches easily. Spoon half of walnut filling onto the dough and use a spatula to spread it out to the edges. Drizzle some of the remaining melted butter over the top. Fold the edges of the dough toward the center about 1 inch. Roll up dough in a jellyroll fashion by picking up one end of the floured cloth and gently getting it started. The dough should then release easily and roll itself up. Fold the roll in half to form a U-shape, or form it into an S-shape and place in prepared loaf pan. Repeat the process with second portion of dough. Brush loaves with beaten egg. (This will give the loaves a nice gloss when baked.) Bake for 75-80 minutes, or until loaves are lightly browned. Cool 20 minutes in pans, then turn them out onto a wire rack. Let cool completely. So interesting, all the variants of this wonderful bread! In my family, we call it by the Slovenian name, potica. Also walnut-filled, but with so much honey and cinnamon it tastes like baklava! My grandmother never used recipes, so my mother got one from a Serbian friend, with a sour cream yeast dough that gets refrigerated overnight. First time – Povitica maker here. I’m confused – the filling recipe calls for “1 cup (1 stick) butter.” The butter I buy comes in 1/2 cup sticks. Could you clarify please? Is it 1 stick or 1 cup? Thanks!! Sorry about the confusion, Lisa. That should be 1/2 cup butter. Daughter of immigrants from Italy and Croatia, I was enamored of the Povitica provided on special occasions from Easter to Christmas and weddings. My wedding was no different; ethnic food was my choice. I continue to bake this delicate, but hardy sweet bread, mostly to satisfy my old tastes but my sons (4 of them) in their 40’s and 50’s also love this bread. I am taking this recipe to my kitchen this moment to practice for the next feast – Thanksgiving! !